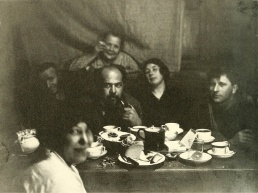 Left to right: Anton Lavinsky, Olga Rodchenko (Alexander Rodchenko's mother), Alexander Vesnin, Lyubov Popova, Nikolai Sobolev, and Varvara Stepanova (in foreground), photographed by Alexander Rodchenko, Moscow, 1924. 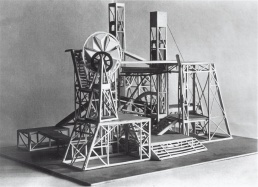 A. Vesnin's model for the set of G.K. Chesterton's The Man Who Was Thursday, directed by Alexander Tairov, 1923. Leonid Aleksandrovich Vesnin. Born 1880 in Nizhnii Novgorod; died 1933 in Moscow. Studied at the St. Petersburg Academy of Art (1901-09) with L. N. Benua. A professor at the Moscow Higher Technical School (1923-31) and at the Moscow Architectural Institute (1932-33). Became a member of the OSA (Association of Contemporary Architects) in 1925. Awarded the Order of the Red Banner of Labor. Viktor Aleksandrovich Vesnin. Born 1882 in Iur’evets, in present-day Ivanovo Oblast; died 1950 in Moscow. Studied at the Institute of Civil Engineering in St. Petersburg (1901-12). Became an OSA member in 1925. Deputy to the first and second convocations of the Supreme Soviet of the USSR, academician of the Academy of Sciences of the USSR (1943), first president (1939-49) of the Academy of Architecture of the USSR, executive secretary of the Union of Soviet Architects (1939-49), professor at the Moscow Higher Technical School (1923-31) and from 1921 to 1930 at the Moscow Vkhutemas-Vkhutein. Awarded the Order of Lenin, three other orders, and also medals. Aleksandr Aleksandrovich Vesnin. Born 1883 Iur’evets; died 1959 in Moscow. Studied at the Institute of Civil Engineering in St. Petersburg (1901-12). Participated in the work of Inkhuk (1921-24) and was a member of the LEF architects’ group (1924). Chairman of OSA (1925-31) and editor in chief of the magazine 'Sovremennaia arkhitektura' (Contemporary Architecture; 1926-30). Taught in the Moscow Vkhutemas-Vkhutein (1921-30) and in the Moscow Institute of Architecture (until 1936). Honorary member of the Academy of Construction and Architecture of the USSR (1956-59). Awarded the Order of the Red Banner of Labor and medals. Architectural achievements of the Vesnin brothers Among outstanding examples of the prerevolutionary works of the Vesnin brothers are private houses, stylized to present Russian architectural classicism (the house of Sirotkin, the present-day Museum of Art in Gorky, 1913, and others). The office, trade, and industrial buildings of this period (the bank on Kuznetski Most in Moscow, 1913, and others) were characterized by a rationalistic approach (the use of a skeletal frame and large glass surfaces). During the first years of Soviet power, the Vesnin brothers (who at that time worked separately) were actively participating in architectural planning, seeking to meet the urgent needs of society (new types of residential houses for workers by Leonid Vesnin, industrial buildings by Viktor Vesnin). The Vesnins were innovators of new construction elements and materials which influenced the emergence of new architectural forms. The introduction of new architectural and artistic principles into the Vesnins’ work was greatly influenced by the theatrical designs of Aleksandr Vesnin, who created a style of architectural depth on the stage by using many-tiered tracery structures with dynamic elements, such as elevators, wheels, and conveyers (The Man Who Was Thursday, by G. Chesterton, in the Moscow Chamber Theater, 1923). From 1923, the Vesnin brothers cooperated on many collective projects, several of which became landmarks in the development of Soviet architecture. From 1925 they headed an art movement known as constructivism. The Vesnins and its other proponents attached great importance to the search for socially new types of buildings, and they underscored the importance of functional and constructive planning of buildings. At the beginning of the 1920’s, the Vesnins concentrated on bringing out the aesthetic possibilities of new construction elements and materials, making it possible to replace blind walls with glassed-in skeletal frameworks (competitive plans for Moscow: the Palace of Labor, 1923; the Moscow department of the newspaper Leningradskaia Pravda, 1924; the Arkos joint stock company, 1924). The architectural forms of the works of the latter 1920’s reveal, above all, their functional purpose (the so-called functional method); that is, the requirements of the functional process were taken into account (the intercommunication of various spaces, premises, and rooms; consideration for the movements of visitors) by resorting to a rational organization in the plan and equipment of the buildings. A pavilion composition was widely used—the dividing of the construction into sections that differed in keeping with the purpose of the building unit, linked by passages and corridors. This composition created new foreshortened effects, and the volume and space relationships were variable (the former House of the Society of Political Prisoners in Moscow, 1931-34, today the Cinema Actors’ Theater); workers’ clubs in Baku, 1928-32; Palace of Culture in the Proletarian District in Moscow (now the ZIL automobile factory Palace of Culture), first section, 1930-34. Other important buildings designed by the Vesnins at this time are the department store on Kras-naia Presnia in Moscow (1927) and the Dnieper Hydroelectric Power Plant (1927-32).